You love to write. You want to write. Heck, people have told you that you should write. And you’ve even heard about freelance writing. You don’t have a clue how to begin or if it’s possible to make a living as a writer. You think freelance writing means churning out bulk writing pieces for pennies. You’re sure there isn’t a way to land a freelance writing job because there’s too much competition out there. When you did attempt to find a freelance writing job, you had no idea how to pitch, what to write or how to “sell” yourself. You feel like you’re spinning your wheels, wasting time reading everything under the sun and paralyzed to take action. And to top it all off, you still have to go to your soul-crushing 9-5 job tomorrow. I was just like you. I didn’t want to go back to a job that ripped me away from my twins. They were only babies at the time, and my mama bear instinct was in full gear. Plus, daycare costs for twins would have eaten up my paycheck. I KNEW I had to stay home to raise my twins, but had no idea how I could do that and still contribute to our family’s finances. I made the decision to work from home. But, where do I start? How can I replace my full-time income by working from home? In less than 6 months, I was able to fully replace my salary while still being able to take care of my twins during the day. To making thousands of dollars per blog post (Yes! That’s $1200 for one blog post). I made a few tweaks and tried some new ideas. I knew I didn’t have time to constantly be seeking out new clients, so I made them come to me! I developed a solid and successful strategy using the right tools, and everything changed. I couldn’t believe it! From pennies to four figures and making a living from writing – without experience. Whoa! You know what? This could easily be you. Finally get paid for your writing. You don’t have to compete for jobs against hundreds of people and in the end, earn pennies for your hard work. Learn the exact blueprint on setting up your freelance business and knowing the exact tools and strategies you need to attract clients, land clients and retain clients. Know where to find high-paying clients. No more hustling ten hours a day and no more sending pitches that go straight to the trash and never see the light of day again. Turn your passion for writing into a profitable and sustainable business. You’ll have the confidence, skills, and support you need to earn serious income as a freelance writer. It’s possible because I’ve done it. I built my freelance writing business part-time while staying home and taking care of my twins. I know it’s achievable. A proven method to help new writers fast-track their way to success with freelance writing – no experience needed. Do it alone. If you do it by yourself you’ll probably make a ton of mistakes – I did. Let me guess – you’ll probably waste time looking for jobs in the wrong places, stress over how to pitch and end up getting headaches over figuring out if you’re doing this right. After three months and no freelance writing job to show for it, you give up. Then you have a minor freak out. Take a proven shortcut that sets you up for success. Write Your Way to Your First $1k is a step-by-step plan on becoming a profitable writer. You’ll get a framework to attract and find long-term clients. You’re stuck at a job you hate. You want something more but can’t connect the dots. And you’re beyond frustrated that what you’ve been trying isn’t producing results. It’s just not working. No job, no income and all you get in return are a lack of confidence and realization that this is it. Just keep going to your day job and put your passion for writing on the shelf. Everything you need to set up a successful freelance writing business that attracts high-paying clients is at your fingertips. No more reading a ton of blog posts, signing up to free eBooks and email courses trying to hack together a freelance writing business. Want to know how to write a pitch that converts? My pitch archive has 12 pitches + the current high-converting pitch I use to land clients. Want to know the best job boards to find clients? Write Your Way to Your First $1k lists over 27 profitable job boards. Want to know all the ways to find clients? I have an entire module on finding clients, plus a highly resourceful list of 95+ ways to find clients. Yup, a handy cheatsheet just for you! (Plus email swipe copy, ready to use templates, tracking sheets and more….just sayin’). All you need is one course – ahem, this one – to learn how to set up your website and discover the tools and skills you need to land your first clients, and more. Plus, this is your fast-track option with everything you need in one place. You don’t have to buy courses on pitching or courses on finding your niche or even courses on setting up a business. Heck! I even teach you how to scale your business and diversify your income. Look, you’ve already wasted hours, days and months trying to become a freelance writer on your own. The best way to learn a new skill is to learn it from someone who’s already done it. I made the mistakes, so you don’t have to. I honed my pitching techniques so you don’t have to spend hours crafting that perfect pitch. I found out how to use social media, inbound strategies, job boards, cold pitching and more, to find high-paying clients. And it’s all in Write Your Way to Your First $1k. Have the freedom to choose the clients you want work with, pick the writing gigs that interest you the most and scale your business to make even more money in less time. Join the students who have taken this course and have been published on Smart Blogger, Huffington Post, Time Warner, About.com, The Write Life and more. Discover what to expect as a freelance writer and understand the skills you need to start off on the right track. Learn the costs to start freelance writing, how to find your profitable niche, what services to offer, creating goals and having that solopreneur mindset. Learn the exact copy to increase your conversion rate (aka more gigs) on your writer website, create and optimize your social media profiles and start building a visual brand online. Learn how to create and display your portfolio for maximum visibility. Find the key components to land a guest post, draft your author bio and format your blog posts to attract high-paying clients. Learn step-by-step how to find clients on job boards, social media, through cold pitching, locally, with boutique content marketing agencies and from unlikely ways. 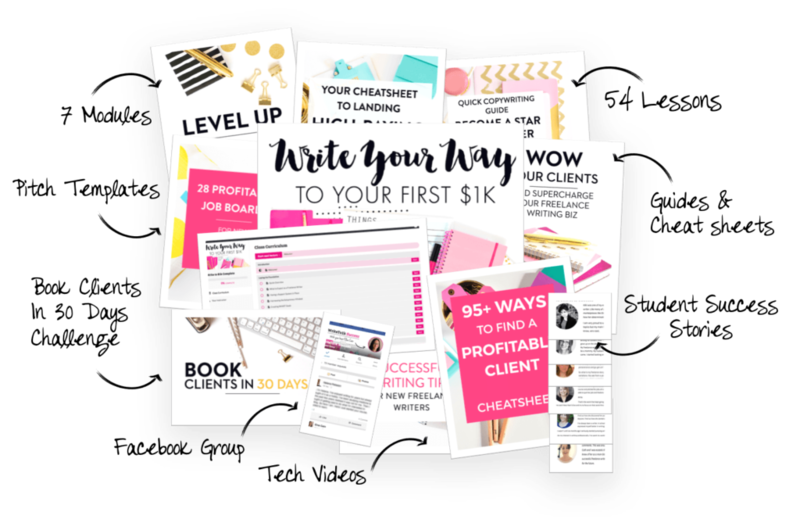 Yes, I tell you all ways to land clients, and you’ll get your handy 95+ ways to land client cheatsheet too. Learn the process to set your rate (so you can make a living out of this) and learn the skills and tools to pitch like a pro. You will also get access to my pitch archive full of swipe copy and templates you can use. Dive deep into writing online for small businesses. You will get a breakdown of how to write a highly engaging, high-paying blog post for your clients. You will also learn (with video enhanced training too) how to format your post, submit your post, source and optimize images, upload posts to WordPress, create zip files, my 5-step editing process and how to annotate your images. Discover the elements of a successful freelance business. Learn how to have a great interview, tips to invoice your clients (so you always get paid), draft your service agreement, how to effectively communicate to clients, the tools to run your business and how to secure recurring work. Get access to my Pitch Archive. See the exact pitches that landed me clients, including my very first client (at $100 per post!). And be sure to steal my current pitch that has gotten me up to a whopping 75% closing rate! The Pitching Handbook lays out the exact elements you need to make your pitch stand out, and use the Pro Pitching Checklist to ensure that every pitch you send out converts. What happens after you land your first client, and then the next? How do you scale your business so that you aren’t hustling 24-hours a day, or spending all your time writing? The Level Up Your Freelance Writing Biz eBook will help you navigate your freelance journey to help you double your rate, get powerful testimonials, dive in into branding your business, and improve your writing skills to boost your income. You’ll get the Budget Tracker Worksheets to help you get your side hustle or freelance business up and running on the right track. You’ll also receive the SMART Goal tracker sheet, to create goals that will lay the groundwork for your future business. You’ll also get the Be a Better Writer Guide and Wow Your Clients Toolkit. These resources will help you hone your writing skills for the online world, and teach you how to wow clients to retain them. Plus more worksheets, templates, and guides! My profitable niche workbook will help you figure out your right niche (psst…it’s okay if you have more than one niche! I encourage that you do!) and find out if your niche is profitable and in need. There are worksheets for you to use and figure out the best niche for you. This challenge was offered to my students to help them use the skills they learned from this course, motivate them and get their business up and running on the right foot. You have specific daily tasks that target client acquisition, networking opportunities and honing your pitching strategy so that you land a client in 30 days or less. Your pitch is the first impression a prospect gets from you. I’ll personally go over your pitch, give suggestions on what can be improved to increase conversions – and I’ll even help you customize it for a particular niche if you’d like! This course has a private Facebook group full of freelance writers who you can lean on, and I’m in there multiple times a day too! I run challenges and Facebook Live training sessions to help you hone your skills. As well, I always let my students in the Facebook group know about any potential freelance writing jobs that come my way. Take advantage of this step-by-step guide with action steps, a private Facebook group and enhanced resource materials today! This is a self-paced online course. Once you sign up and pay for your course, you’ll have access to all the modules and supplemental material. You can read all the lessons in a module in one day, or take as long as you need to go through each of them. Each module is full of action-packed, easy-to-follow lessons. By the end of the course, you’ll have a solid foundation, a new skill set and the tools and steps you need to earn your first $1k (and more) from freelance writing. Hey future freelance writer! I’m Elna and I was just like you not too long ago. Once I found my niche as a freelance writer for digitally native brands, within six months I replaced my full-time income by writing part-time. My writing has appeared on OptinMonster, Blogging Wizard, Huffington Post, Psych Central, and I ghostwrite for some big-name influencers. I’ve helped hundreds of students find their voice, niche and strategy to prosper as a freelance writer. And now, I want to help you wildly succeed! Should you Certify Your Skills? Your Writer Platform: What Is It and Why Is It Important? Spread the cost over 3 easy monthly payments. Lifetime access. Save over 10% with a single payment up front. Lifetime access.